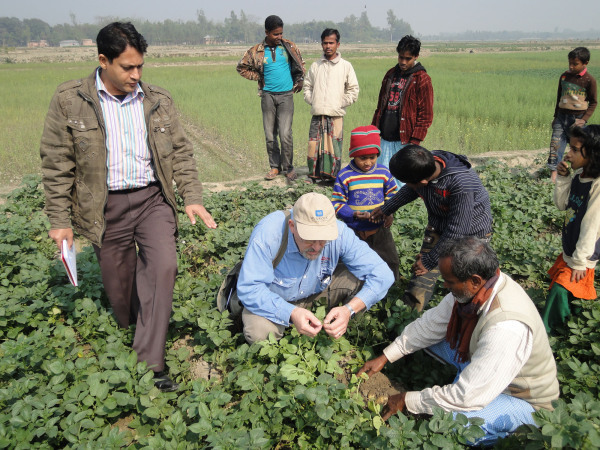 …and potato production demonstrations in Bangladesh. We look forward to new adventures in 2012! Happy New Year from the Winrock Volunteer Technical Assistance Team! Happy holidays and thanks again to all of our hardworking, dedicated volunteers! We look forward to more adventures with you in 2012! We would love to hear your volunteer stories! We invite our previous and current volunteers to contribute to this blog site by sending in your stories. What was your experience as an international volunteer? What did you learn? What inspired you? Congratulations to volunteer Judy Moses who recieved a service award from the Volunteers for Economic Growth (VEGA) alliance this year! Winrock is so grateful for your time and energy! “In mid October 2011, I arrived in Bougouni, a town of 25,000, in a mainly cotton growing region of southern Mali. 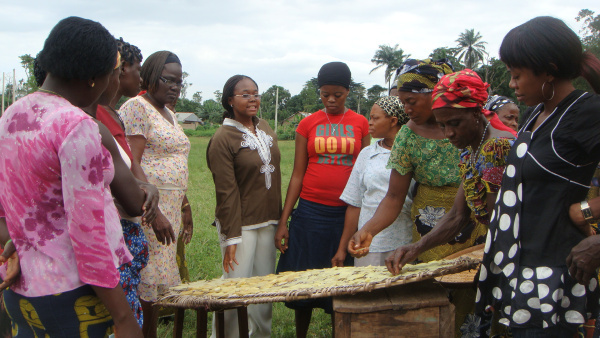 My task was to assist a newly formed fish farming cooperative with business training. Do not confuse Mali with Malawi in East Africa. But you can remove the aw from Malawi and get Mali. Mali is poor: its GDP per capita ranks 205 of 227 countries tracked – – $1,200 per person vs. $47,000 in theU.S. It is a large country, almost twice as big in size as Texas…but less populated: 14.2 million people live here, 25.1 million live inTexas. To find Mali, head due south from the southern tip of Spain into the bulge of West Africa until you reach landlocked Mali – – shaped a bit like a butterfly in flight. So, you can think ofMalias a big, poverty stricken butterfly. But a beautiful one. I spent 2.5 weeks, helping the fish farmers’ cooperative. They are attempting to raise tilapia and catfish in hand dug ponds. The farmers’ hope is that their fish ponds will provide additional food for their families, plus some extra to sell at the market in Bougouni. My assignment followed, and overlapped by four days, work done by another volunteer. Like me, he is an American volunteer. 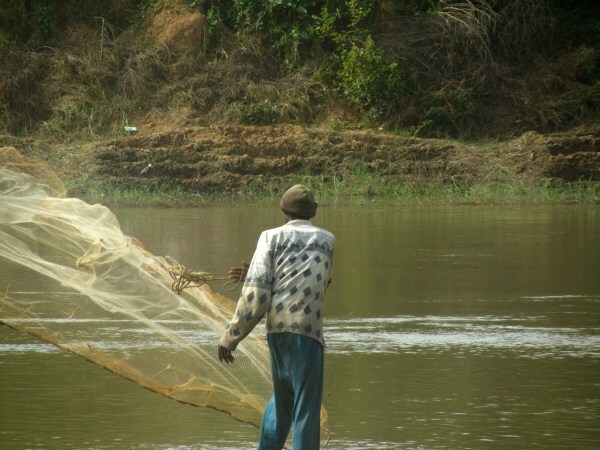 His role was to teach the aspiring fish farmers how to build effective ponds and how to raise fish. 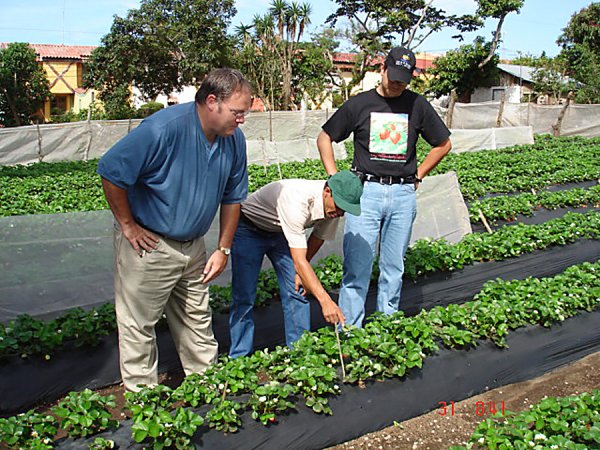 My job was to help the fish farmers develop their business, sales, marketing and production plans. From the other volunteer, I learned that tilapia are mouth brooders. After the female lays her eggs, the male will fertilize them. The female will then scoop up the eggs in her mouth, where they will incubate until hatching. She will not eat – – cannot eat – – until they hatch and swim out of her mouth. While still tiny, if they spot a threat, say a wading heron or a hungry catfish, the little tilapia will swim back into mommy’s mouth. This flight to mouth-safety will continue until they can no longer fit there. Fascinating. I spent many days in Toula, a small village just ten miles outside of Bougouni. The members of the fish farmers coop would gather under a large shade tree next to their mud walled compound to listen to my morning business lesson. In the afternoons we usually visited their prototype fish pond to ensure that the fish were still alive. Since my lessons were given outdoors there were many interruptions to deal with. One day during my lesson a hunter from the village walked through our alfresco classroom carrying a shotgun and a recently bagged rabbit – – poor Peter Cottontail. My class erupted with congratulations and praise for the successful hunter. That day the villagers ask me to stay for lunch. The village ladies cooked up enough food to feed the entire business class. As a visitor I was invited to dine in a nearby mud and thatch hut with senior members of the cooperative. Six of us sat on low stools around a large dishpan full of rice (I think it really was a dishpan shortly before it was filled with rice.) All six of us ate with our hands out of this communal vessel. And we ate the same meal found in every restaurant in town: chicken with rice. But that day, the chicken was augmented by the ill fated Mr. Cottontail. That culinary change of pace was quite welcome. Variety is the spice of life. Also adding variety was the daily snack our host fed us. Thin strips of grilled beef were skewered on a wooden stick, then we rubbed the beef-on-a-stick in a dry mixture of ground peanuts, millet, chili and other spices. And also, dried, ground goat testicles. A fair number of the villagers who attended my training classes are illiterate, so I used symbols as much as possible when I drew on the flip chart. For example: A fish silhouette with a sun above it represented a dried fish. A small fish with an arrow toward a larger fish indicated size growth over several months of feeding. A fish with whiskers signified a catfish. But just how do you represent such business terms as a board of directors with these signs? It was kind of fun trying to think creatively in symbols. One of the legacies of French colonialism inMaliis that French is the official language. However, outside of cities and towns (like Bougouni) where the educated speak French, numerous local languages are the means of communication. 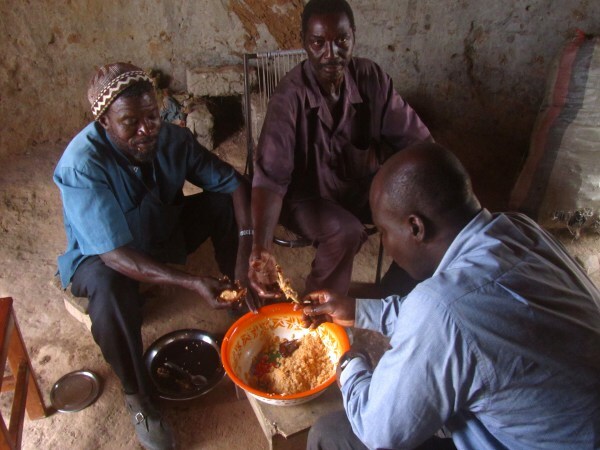 About 80% of Malians speak Bambara as their first or second language. Consequently, Bourama, my interpreter turned my English into occasional French and more frequent Bambara. Through all of this I learned that when working with an interpreter it takes twice as long as normal to share an idea with the audience. And twice as long to learn what their response is. I usually made up for this delay by talking twice as fast…and thinking double time as well. But it really wore me out. Ultimately, I trained about 30 people in fish production planning, marketing and sales of fish, how to organize a cooperative, and basics in business planning. And also in symbol drawing. In addition to the hunter mentioned above, I learned to deal with other disruptions. I pretty much got used to the crowing rooster, chickens, and guinea fowl in front of my flipchart. As a teaching point I asked the class the age old business question: What is the difference between marketing and sales? One hand shot up, then another and another, soon over half the class had a hand in the air. I thought, wow, these farmers are really business-sharp. But it turned out they were not answering my question. Instead, they were waving at a friend bicycling along the road that ran past our outdoor classroom…and shouting greetings too. As well, they inquired about the health of his second wife and new baby and about the price of corn in the market. I just about had regained their attention when a young man herding thirty cows down the road lost control of his cattle. The herd veered off toward the village cotton field. Most of my students jumped up to divert the cows from their precious cash crop. 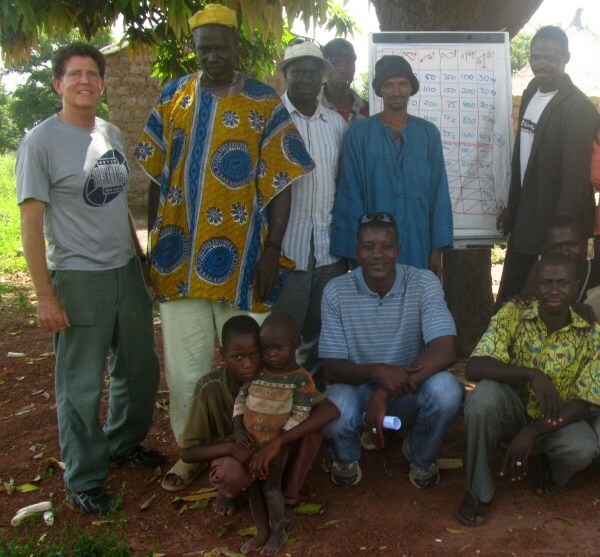 *Bill’s trip was part of the United States Agency for International Development (USAID)-funded Farmer-to-Farmer program in Mali.